This series is an attempt to change the perception of the litter box. It does not have to be gross, smelly and something you hide. Instead, be proud of how clean you keep your cat litter box. Would you want to go to the bathroom out in the garage in inclement weather? I bet not! How do you feel about getting swatted in the face each time you come and go from the restroom? Cats do not find it fun either. Do you want to use an unflushed toilet in a public restroom? Well, your cat doesn't either! We complain when they use locations other than their litter box, yet what we provide is so often unacceptable. Join me and let's be the change that cats so desperately need. A large box with two exit routes, out the front or jump out the top onto cat condo. Litter boxes should be BIG! In fact, one and a half times the length of your cat! They should be CLEAR so they can see who is approaching. Cats are a species that are both predator and prey. When they eliminate they are in their most vulnerable state. They must feel safe and secure when they use the box or they will find another place to go to the bathroom where they do feel safe! 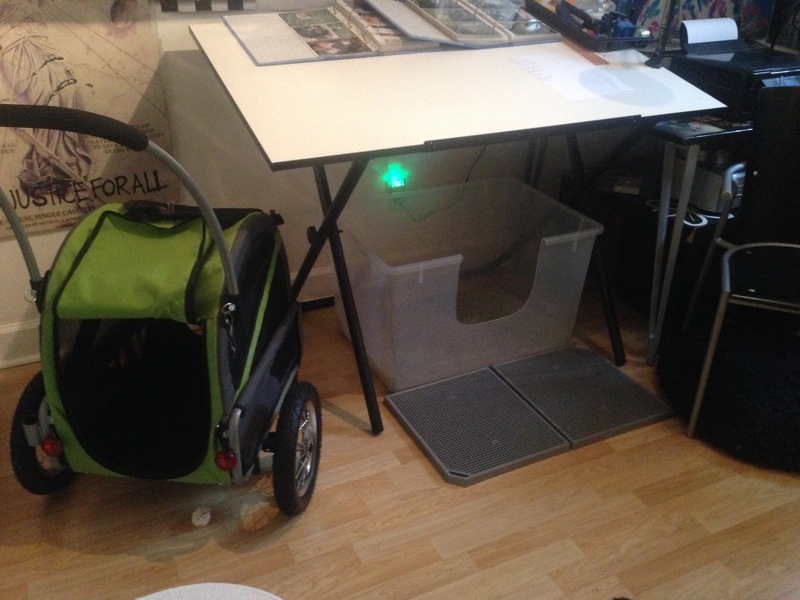 Large, clear storage totes work best. Bigger is better! Can't live without a hood? An example of what NOT to do! Outdoor cats do not eliminate in cave-like environments. This would leave them vulnerable to being attacked or hunted. If you got smacked in the head or ambushed every time you used the bathroom you would find a new, safer place to go, wouldn't you? Left: an opaque hooded box can harbor odors and leave cats feeling threatened. Notice the "dead end" placement too. Right: if you just cannot live without the hood this is the best covered box to have because at least it is clear so the cats can see who is approaching and be able to anticipate an ambush. This should only be an option, but NOT the only box offered! A hooded box that is 100% clear. Wait, I need how many litter boxes? 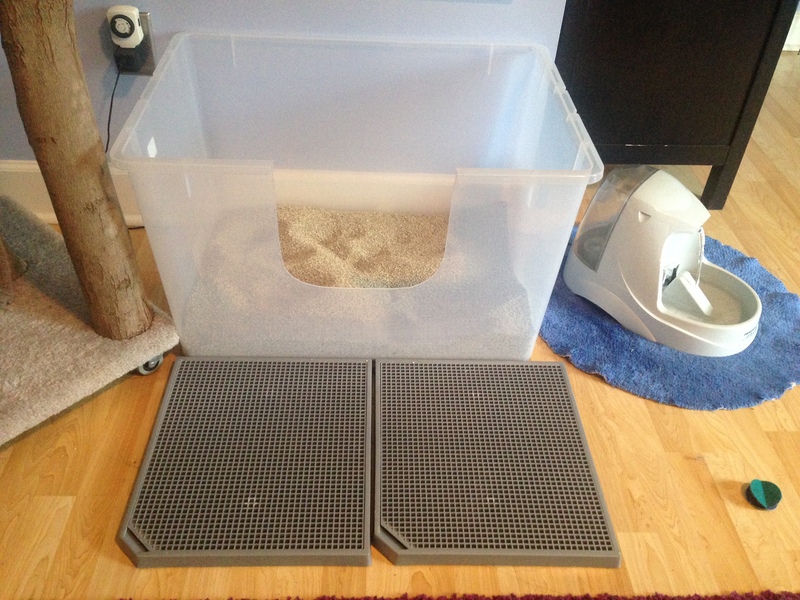 If you have 2 cats than you need 3 separate litter box LOCATIONS! Cats prefer to urinate in one location and defecate in a completely separate location. This is normal cat behavior. 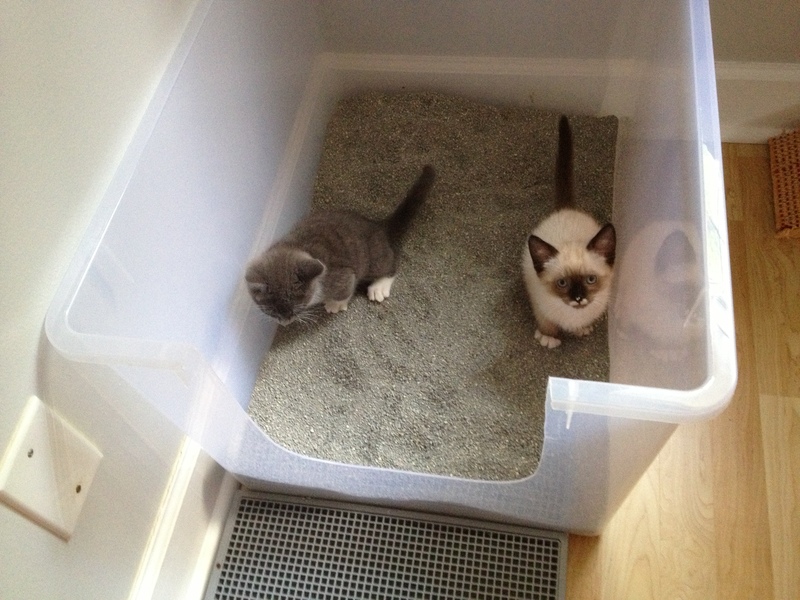 Even if you have one cat you should provide two separate litter box locations. Cats are fastidiously clean animals and never want to be forced to step on urine clumps or feces to eliminate. 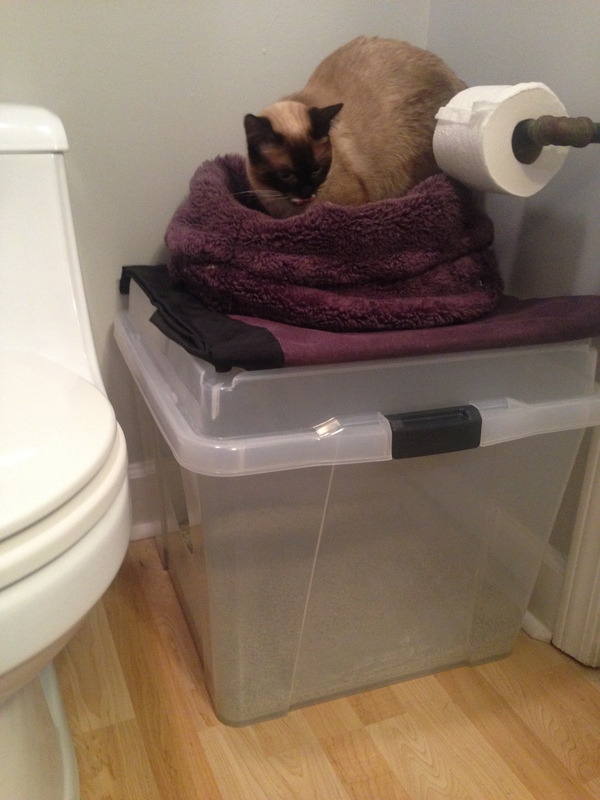 Even if you have one cat, a litter box option on every floor is recommended. After all, we usually have a toilet on every level now don't we? 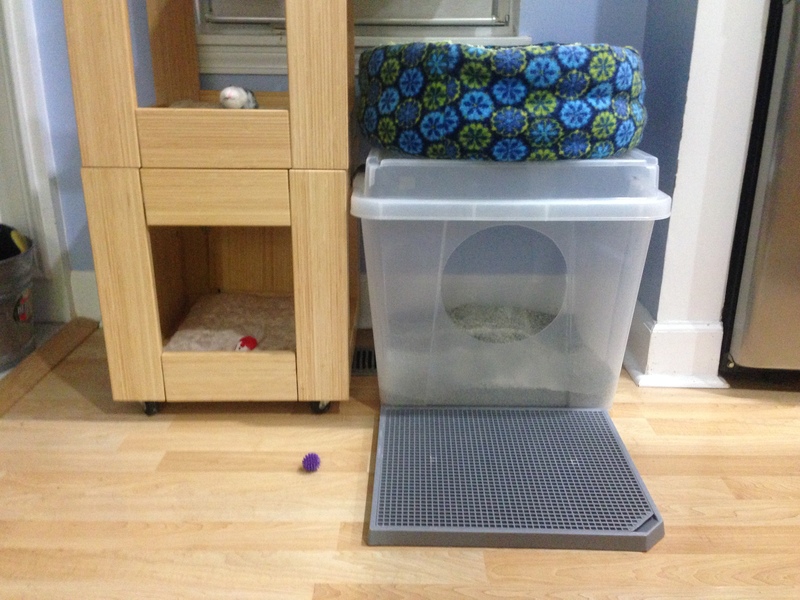 The more box locations you provide the more difficult it can be for one cat to "resource guard" and keep other cats from being able to access the boxes. 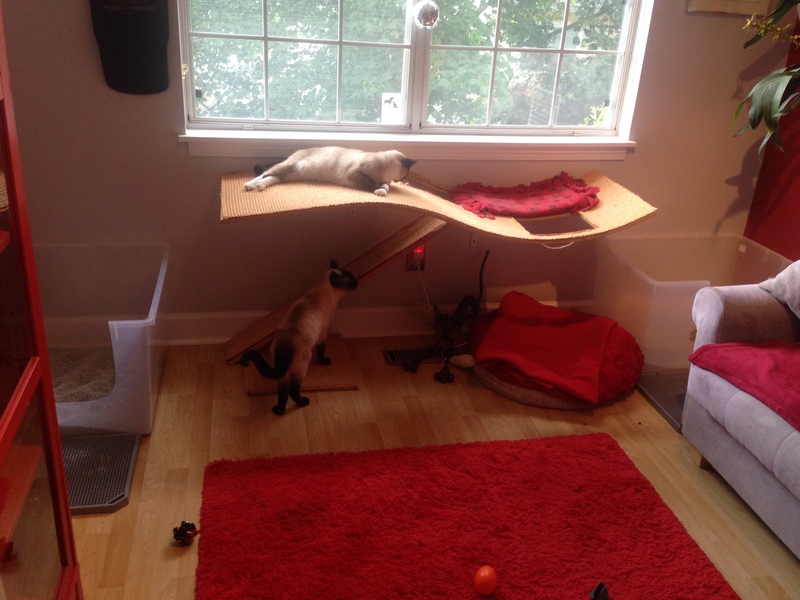 Resource guarding is a common reason for elimination outside the litter box. One cat cannot be in multiple places at one time! 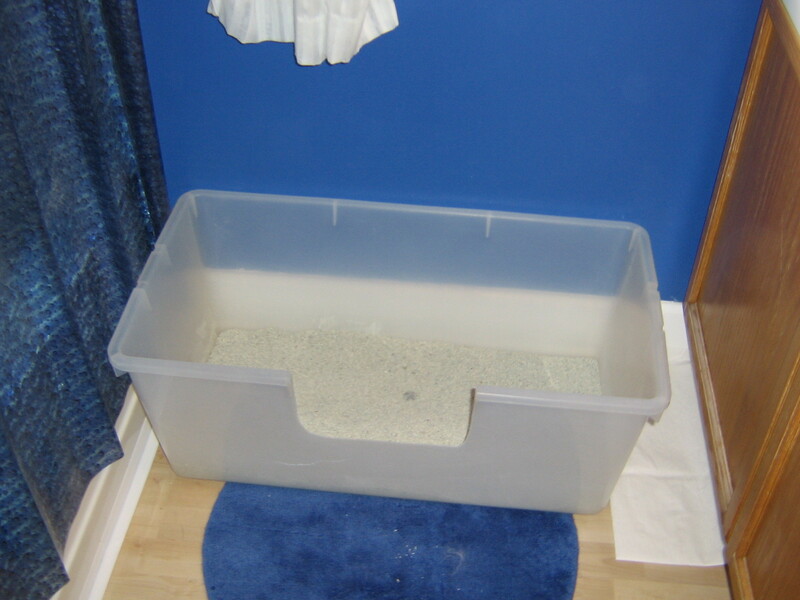 Litter boxes should be spread out, or "heathered" throughout the home. This also prevents odors from being concentrated in one area. The truth of the matter is that this is simply a guide. It may be necessary to offer more boxes based on the relationships of the individuals sharing the space. These are guidelines but not hard and fast rules. Offer as many boxes as needed to keep the cats using them! Where on earth am I going to put all of these litter boxes? Cats prefer to leave their smell where your scent is strong. Elimination is also communication! They want to mark you, their favorite human! Cats prefer to urine and feces mark around the perimeter of their space whereas scratch marking is done in high traffic pathways. 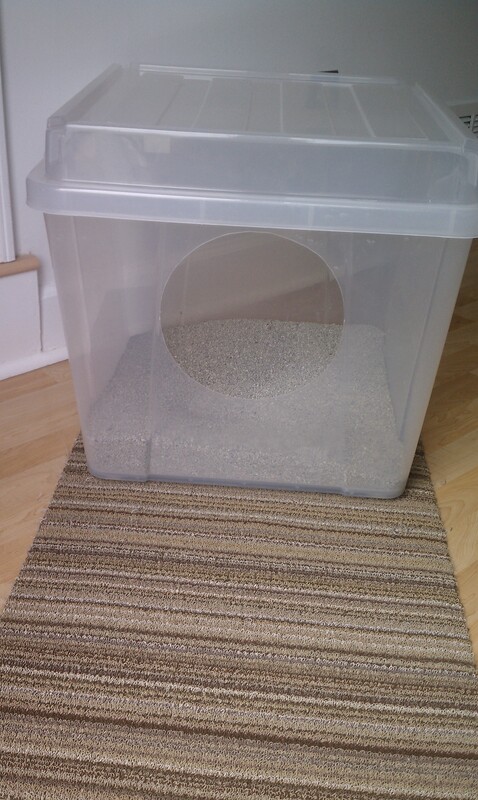 So be sure to place litter boxes around the perimeter and not in the center of the room. Scoop daily, twice a day is better! This box is in a living room (look closely it is beside the refrigerator heading into the kitchen). 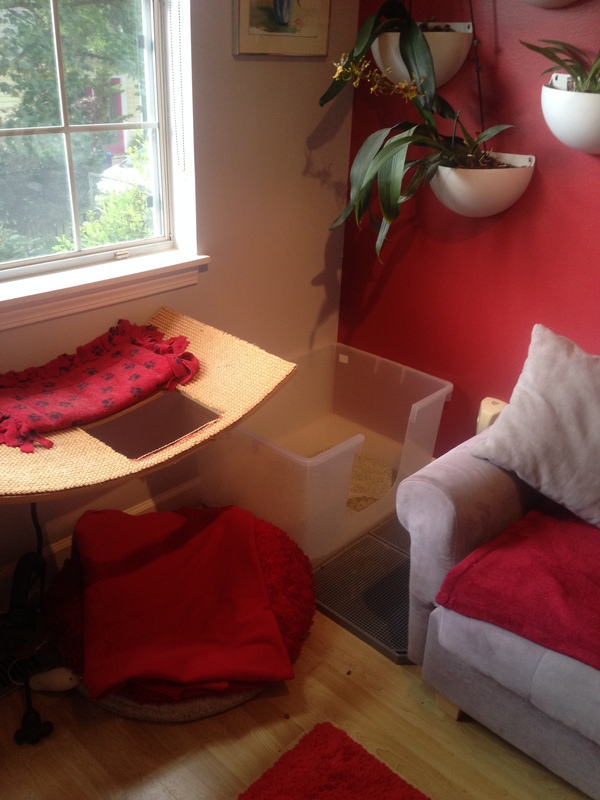 Note all that is provided in such a small area: vertical space, window perch, horizontal scratching options, canned food dish up high away from the dog, litter box and beds all in 2 sq feet! A close up view of living room box. This box is in a dining area. The cats were urine marking the back door and needed an appropriate target in this space. 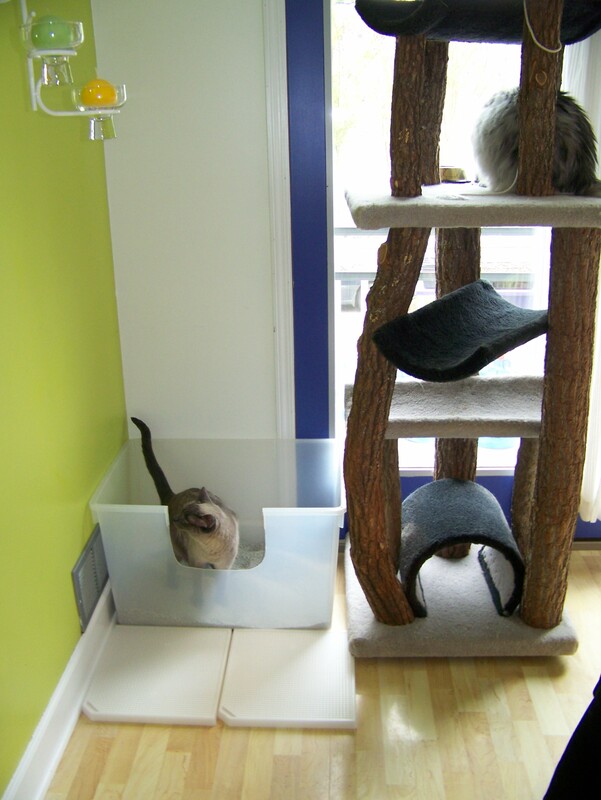 They can exit the cut opening or jump up onto the cat condo to escape a potential threat. It is important to avoid dead ends when selecting locations. 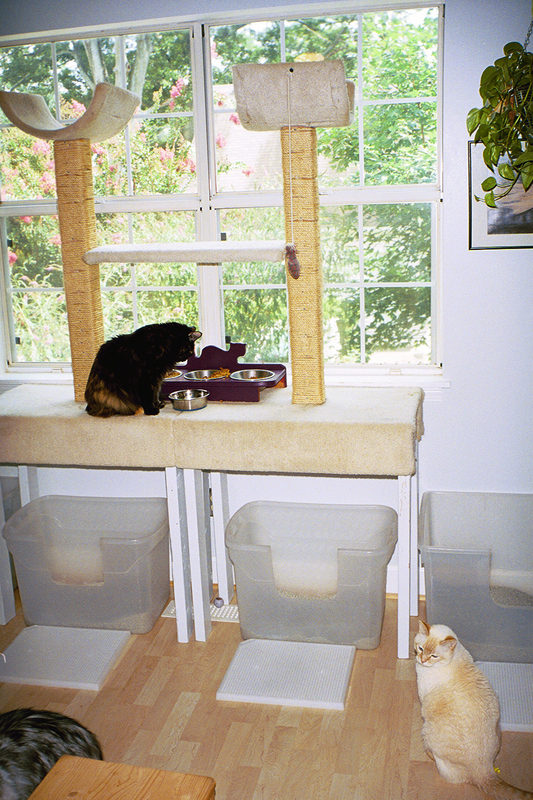 Feeding station, vertical space, window viewing, and litter all in a small square footage. Bathrooms! You go to the bathroom there, why shouldn't your cat?! It's purrfect. 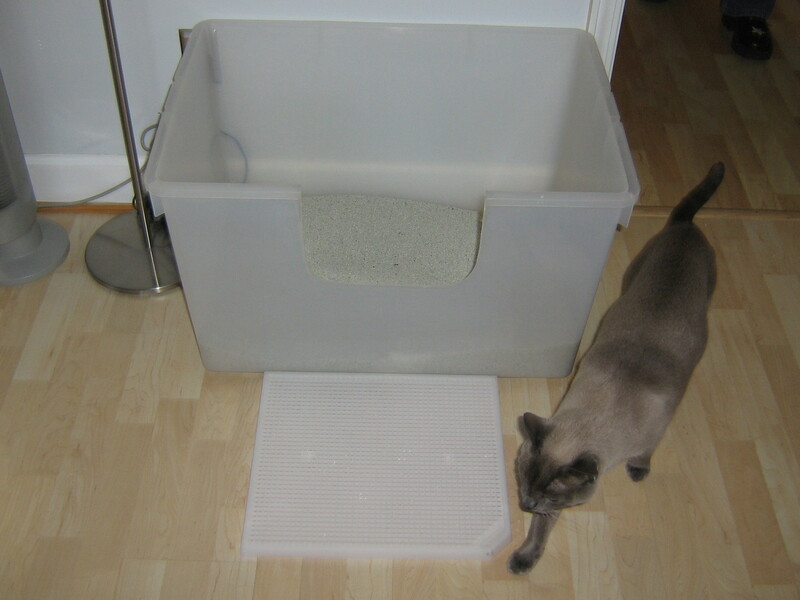 Left: a step out mat catches the litter to maintain cleanliness. High sided box contains most of the litter scatter. Right: box opening is turned toward the toilet to minimize litter scatter and a bed placed on top to maximize amenities in a small home. These two things are ONLY okay because of a harmonious household. Ideally rotating the opening to face out would provide easier access. It would NOT be recommended to have a bed on top in a home with aggression problems. 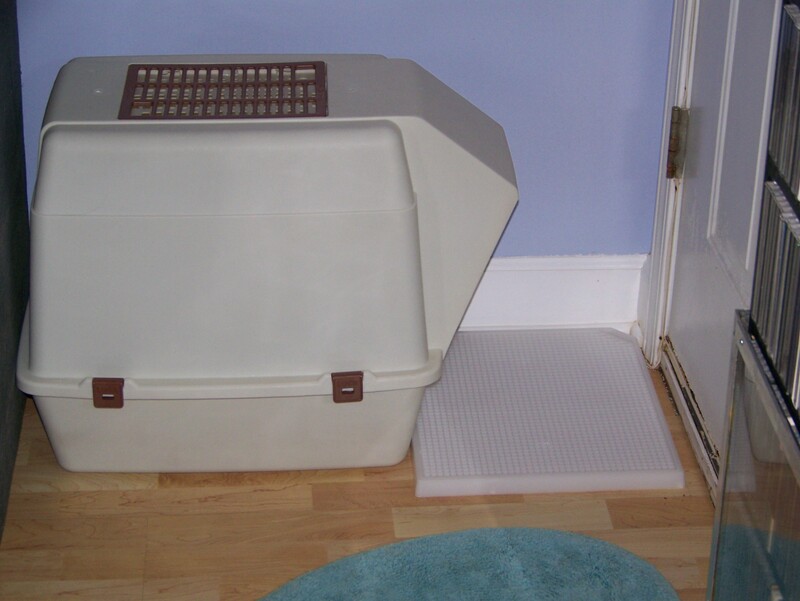 Litter boxes should be separate from food and water sources. Cats are clean animals and do not want to eat near where they eliminate! Dens, sitting rooms, sun porches, home offices, and yes, even the master bedroom! Two boxes at opposite corners with multiple exit routes. 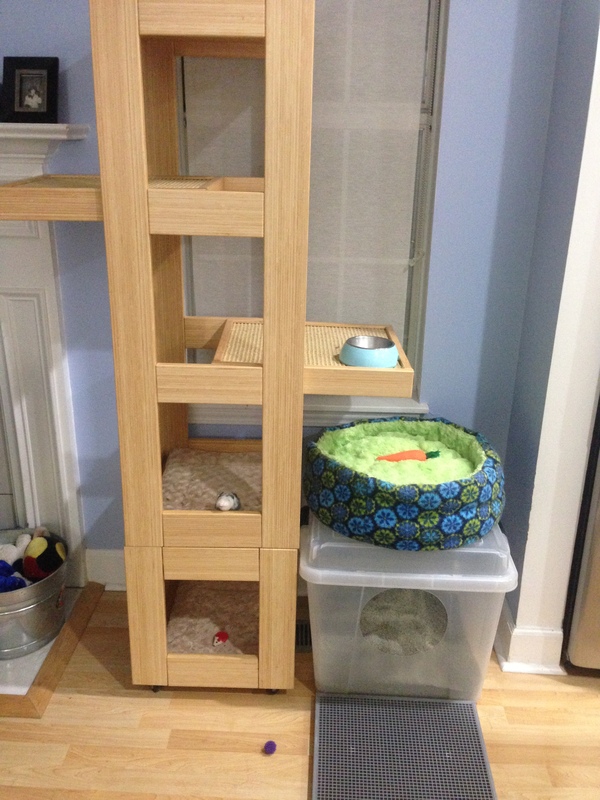 Master bedroom: can food bowl, water fountain, litter, foraging toys, & vertical space. Offers multiple escape routes: jump up, go behind sofa or exit to the front of sofa. Cat rooms (a.k.a. 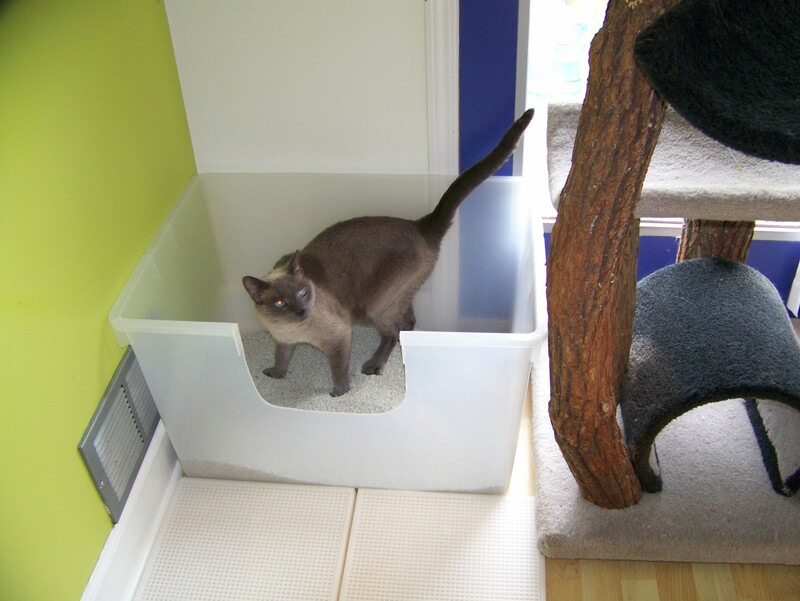 litter box rooms)-they are dusty, stinky and gross and cats do not feel the need to mark there. 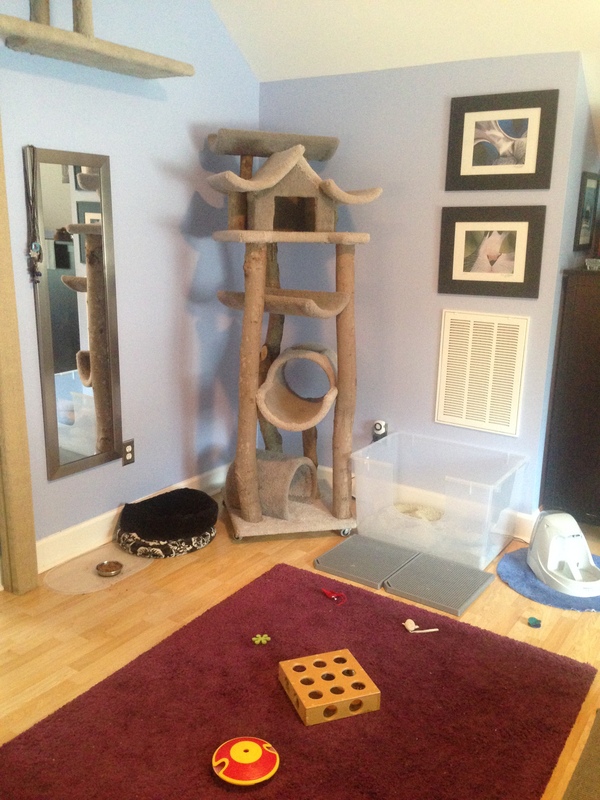 How much time do you spend hanging out in the "cat room" anyway? Food and water are often in these rooms as well which is also not ideal. Having to go through a cat door to get to the box is really no different than a hooded litter box. It is threatening and scary because they cannot anticipate what is on the other side. Automatic boxes are not preferred. 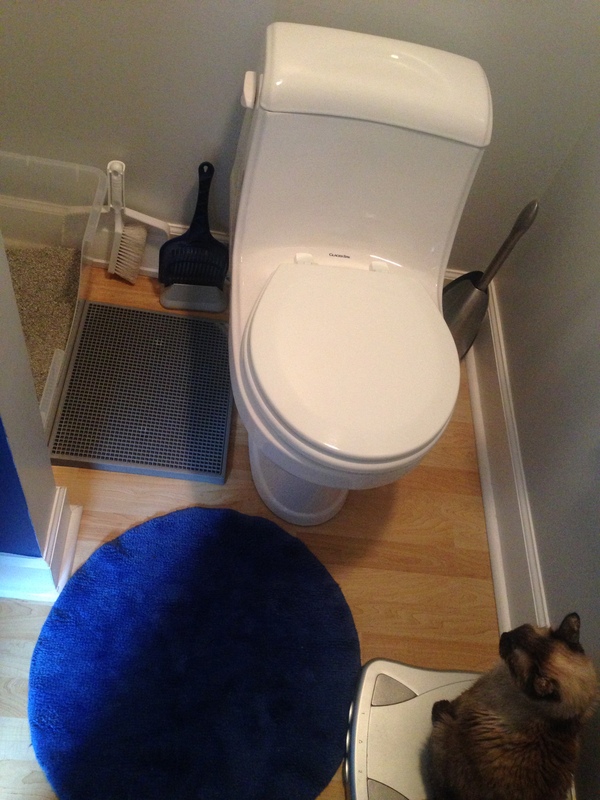 Monitoring your cat's litter box output is a very important part of monitoring their health. The size and shape and frequency of the urine clumps and the consistency of the stool is vital information for you to know. Automatic boxes take that information away! If you use one, you should always have a regular box as well! A whole bunch of boxes lined up in a row is just one giant box to your cat! We humans work really hard at hiding litter boxes, we try to avoid scooping them, and apparently we cannot stand the sight of the box either. It's crazy! You have cats, and cats need to go to the bathroom. Why do we keep making it so damn difficult? Big boxes, open areas, keep them clean. 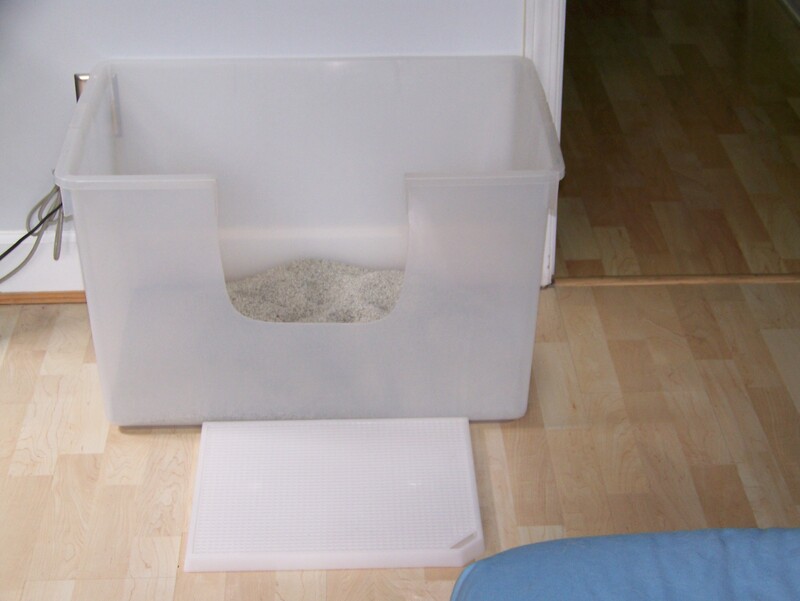 Have litter boxes you are proud of and be the change cats need! One of the best compliments I have ever received was when a guest arrived at my home and asked me, "where is all the hair and why doesn't it smell in here"? I had 16 cats and 3 dogs at the time. 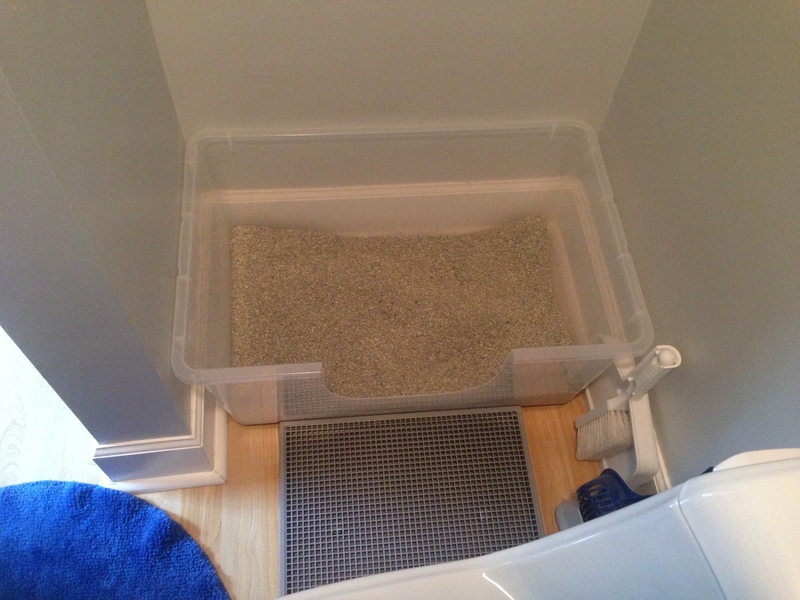 Our home is 1200 square feet and I made room for 13 litter boxes. Join me, we can do this folks! Get the scoop and be the change! Previous Post: « IKEA hack-DIY Food Puzzle for Cats!